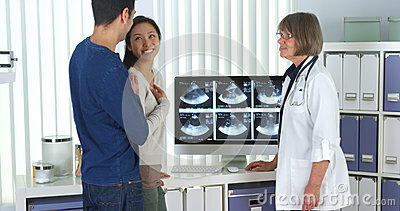 Do not wait until you become pregnant to visit your doctor. Seeing your doctor before you become pregnant is the best time to discuss any health conditions that can negatively affect your pregnancy. Health conditions that can affect pregnancy include but are not limited to diabetes, high blood pressure, sexually transmitted infections and autoimmune conditions, including thyroid disorders. During a pre-pregnancy visit, your doctor will discuss the medications you currently take. These include prescription and over-the-counter medications, as well as herbal supplements. Some medications have been tied to a risk for serious birth defects. Your doctor will determine which medications you can continue to take if you become pregnant. In addition, you and your doctor will discuss the vaccinations you need before becoming pregnant, during pregnancy and after delivery. Your doctor may even recommend starting folic acid at this time. Folic acid, a vitamin, is important in preventing birth defects in the brain and spine. In fact, a woman who gets enough folic acid at least one month before and during pregnancy may lower her baby's risk of birth defects of the brain and spine. Your doctor may recommend an additional folic acid supplement (4 mg), depending on family or personal history of a neural tube defect like a cleft palate. Alcohol, smoking and drug use may cause complications during pregnancy, as well as serious, potentially life-threatening problems for the baby. There is no safe level of alcohol intake during pregnancy. Current recommendations call for women to stop drinking alcohol when they begin trying to become pregnant. If you don't already eat right and exercise, try to establish these healthy habits before you become pregnant. Discuss your nutrition and exercise plan with your doctor. Your doctor will determine what is best for you. Establishing healthy habits can help you maintain a healthy weight before you become pregnant. Women who are overweight, obese or even underweight may have a higher risk of pregnancy complications. These complications can negatively affect both you and your baby. Speak to your doctor about what weight is healthy for you and how to achieve and maintain that weight before you become pregnant.